The world of Windows Phone 7 is starting to hot up these days, with the infamous NoDo update starting to roll out to lucky handset owners. 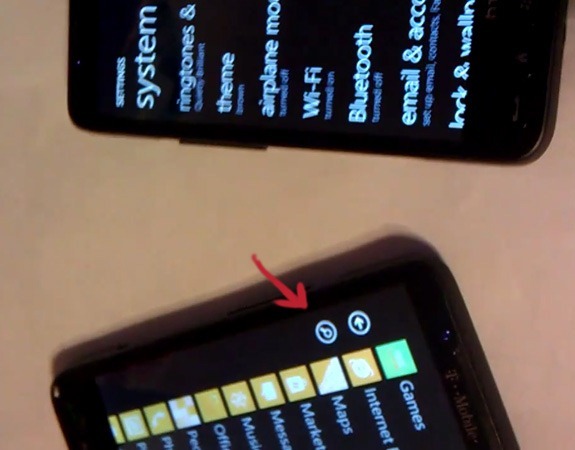 Now the fledgling OS is in the headlines once again thanks to ‘The Dark Force Team’, a group of hackers who sprung to fame when they managed to get WP7 onto the popular HTC HD2 hardware. The hackers today released a video of the NoDo update running on, unsurprisingly, another HD2 handset – but that’s not the interesting thing here. In a shot toward the end of the video another handset ‘accidentally’ finds its way on-camera. Looking closely it appears the extra handset is sporting a new search button, prompting Pocketnow (amongst others) to speculate that the hackers have managed to get their hands on what many are calling Windows Phone 7.5, dubbed Mango. The fact that a new, major update to WP7 is already floating around the internet and in the hands of hackers will be embarrassing to Microsoft, though it’s great news for the growing WP7 fan case. Check out the video to get a glimpse of the future WP7 update.